Didn’t expect to be writing this review so soon!! 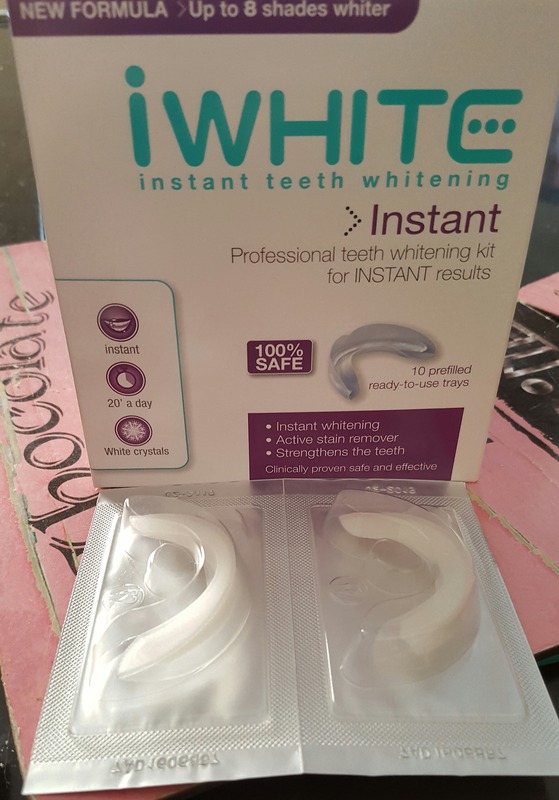 So last Thursday night I used the iWhite Instant Teeth Whitening System for the very first time and to say I was excited to start doing these would be an understatement. I had heard absolutely fantastic reviews about this system and lots of people I admire from Marissa Carter to Jen from Too Dolly Makeup had used them and loved them so what could possibly go wrong right? The system itself is a box with ten sets of prefilled trays included and they retail at approximately €30, I got mine in Boots and that’s what it cost me. Before you use the system you must brush your teeth gently to remove any debris and then peel back the foil on one of the packs and place a pre filled tray in both the upper and lower set of your teeth making sure that the gel is in contact with your teeth but at the same time not biting down too hard as you’ll break it. At this point you are to leave the trays on your teeth for twenty minutes and then remove. It sounds so straightforward but here are the problems I had with it. Firstly the taste, I really wasn’t expecting it to taste so vile, I thought it would be all minty and fresh seeing as it’s a product for teeth but no, it tasted like liquid chalk and it took everything I had in me not to take it out after the first five minutes. Secondly, and I apologise in advance for the TMI of this part but I can’t think of another way of putting it, the spit!!! I had no idea what to do with all of the saliva I generated during that 20 minutes, I felt I couldn’t swallow it because the taste was so unpleasant but I expect that that is what you’re supposed to do with it alright. So unpleasant I just can’t adequately describe how bad it was. Anyway after the 20 minutes were up I removed both trays and following the instructions I gently rinsed my mouth out with water to remove any residue of the whitening product from my teeth and the second the cold water hit my teeth I knew I was in trouble. The sensitivity and in some areas actual pain I felt was completely unexpected, I understand that some whitening products do this but this one describes itself as being 100% safe as it is hydrogen peroxide free, in fact it claims to strengthen the teeth as it delivers a highly soluble source of calcium, I’m afraid I do not agree. I wouldn’t have ever considered myself to have overly sensitive teeth but maybe I do as I know others who have used this product with no problem whatsoever so it obviously suits some people I wish I had been one of them. Even on Thursday night after I had finished using the first set and felt the sensitivity I thought I’d be still willing to use it again to see if it got any better but I decided today that I wasn’t, seeing as I still have sensitivity in some of my teeth now four days later. I’m so annoyed, I was really looking forward to using these and obviously they weren’t cheap either and I now have no use for them. By all means give them a try if you want to but I would think very carefully about it if you have any sensitivity whatsoever in your teeth, I really don’t think it’s worth the risk. We cant use these types of products because we have sensitive teeth too! We use charcoal to whiten our teeth now and it works so well! I am always tempted by teeth whitening products, but worry about teeth sensitivity. I think after reading this I will only let the dentist whiten my teeth if I ever take the plunge. Thanks for writing this honest review. oh I’m so disappointed to read tgis as I am looking into home whitening kits at the moment . really want to say thanks for the honesty it’s good to hear feedback like this ,last thing I want is pain!